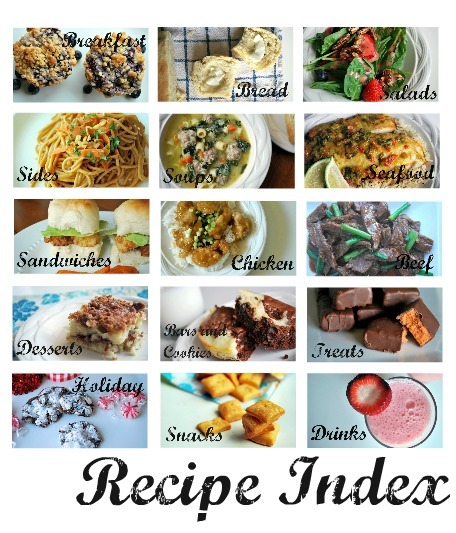 I created a Recipe Index. I know it is pretty exciting isn't it??? So from now on if you are in search of a recipe that I have done here on the blog you can simply click on the Recipe link above. Then you can find everything categorized under the appropriate heading. The title of each recipe is listed with a link that will send you to the original post. I hope you enjoy this as much as I do. It was fun to go back and see all the different recipes (not so fun to see some of the first photos and how super duper ugly they were). Needless to say making this list made me SUPER hungry. Okay, go have fun. Take a gander at the recipes. I am positive you will find something fun and yummy to make this weekend! If I haven't said it lately, thanks a million for reading. I always enjoy looking at your blog, this will make it so easy to find your great recipes! Thank you so much! I was hoping you would do this. You have such great recipes and I wanted to be able to see them all at once and it will also be easier when someone asks me for a copy of the recipe of something I make for them from one of your recipes. Wonderful job! PS I'm making that strawberry salad tonight for small group! This will come in handy! I love your recipes. I am so excited! Thank you so much! I use your recipes often! This will make it so easy!